The World Chefs Tour is coming to South Africa! 35 international chefs from eight countries touched down in Cape Town last night to embark on an unforgettable ten-day culinary journey as part of the Bidvest World Chefs Tour Against Hunger. The Mother City is known for its superb cuisine and talented chefs and yet there are still many who do not eat even the most basic of daily meals. This event encourages us all to play our part in the fight against hunger and we ask that the public combine their love of cuisine with an open heart to giving, by participating in this event as Cape Town Tourism CEO Mariëtte du Toit-Helmbold says. The plight of starving children in South Africa has motivated 250 chefs from 44 countries, along with over 700 local chefs, to give up their time and share their expertise during a massive ten-day fundraising drive throughout the country. What is going on at the Chefs without Borders Food Festivals? Key events during the tour will include food festivals at various Southern Sun hotels in Johannesburg, Durban, Cape Town, East London and Nelspruit. The public will be able to sample speciality dishes prepared by the chefs, there will be demonstration kitchens at various shopping centres as well as gala fundraising dinners, primarily for corporates, at which speciality items will be available on auction. By supporting these initiatives you will not only be able to taste cuisine from countries around the globe but you will also play a role in raising funds to feed thousands of children. "These events are going to be really exciting and a great way for the public to support the Tour while enjoying some great cuisine and learning a trick or two to take home to their own kitchens," says Bill Gallagher, the World Chefs Tour founder. Proceeds raised during the Tour will be donated to the Akani Diepsloot Foundation, African Children’s Feeding Scheme and Meals on Wheels Community Services, all of which do extraordinary work in their communities, as well as various other regional charities. 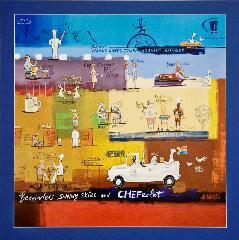 The World Chefs Tour is an initiative started by Bill Gallagher, one of the world’s most renowned chefs, in 1993. This year’s Tour, the third of its kind, is being arranged by the South African Chefs Association (SACA) and the Academy of Chefs, under the auspices of the World Association of Chefs Societies (WACS). Dr Bill Gallagher is also the tours’ patron and its convenor is Martin Kobald, former SACA president. According to Gallagher their "objective, through Bidvest’s support and the fundraising initiatives of the Tour, is to ensure that we can sustainably feed children over the next five years. It costs R10 a day to feed a child, and with R5 million we can feed 300 children every day for five years." The proceeds raised through the Tour will not be distributed in the form of monetary donations to charities but will be used to develop feeding schemes for the beneficiary charities and to buy the food needed to sustain those feeding plans for as long as possible. Cape Town International Convention Centre will be the scene of live cooking demonstrations by the big-hearted and talented international chefs, with demonstration kitchens providing culinary theatre at its best – and the opportunity to taste mouth-watering international dishes from around the world. Demonstrations take place daily from 10:45 to 17:30 at hourly intervals, with a line-up that includes demonstration of culinary delicacies from Canada, Norway, Austria, Germany, the Czech Republic, USA, Singapore and Egypt. Tickets? Entrance is free, but the public is encouraged to do their part by donating to the cause or purchasing their very own BWCTAH chef’s hat for just R10. You can also book for the Chefs Without Borders Food Festivals at participating Southern Sun restaurants. •	Scintillating Taste of Singapore at Harbourview at Garden Court Eastern Boulevard (021 448 4123) Bookings at the restaurants are essential and can be made by calling your preferred restaurants and quoting World Chefs. •	By buying framed or unframed prints of the official 2011 Tour painting by well-known artist Frans Groenewald, as seen above. •	South African pop singer PJ Powers, has re-recorded the song written for the 2003 Tour, Sing Children Sing, to support the Tour. The music will be available as a cell phone download for R10 to boost the fundraising drive. One only needs to sms the word ‘child’ to 31755. Chefs from the 44 visiting countries have paid their own way for the Tour and will be donating their time, expertise and services free of charge. Bidvest has donated R3.6 million to the cause, while Southern Sun is providing all the accommodation for the 250 visiting chefs. "At Southern Sun we are honoured to be a part of the Bidvest World Chefs Tour Against Hunger. Food is an integral element of our business so it was a natural fit to partner with Bidvest on this worthwhile project. Creating awareness of the plight of hungry children in South Africa is one of the most effective ways to raise funds and eventually make a difference. This project offers every South African a chance to get involved. For Southern Sun employees this is a unique opportunity to put our knowledge to work to improve the plight of the hungry. I am excited and confident that this project will reap fantastic results,” says Graham Wood, Managing Director of Southern Sun Hotels. Brian Joffe, Chief Executive of the Bidvest group of companies, agrees saying hunger in South Africa is a challenge crying out for urgent action. “The problem is huge, but even the smallest contribution makes a difference if enough of us work together. That’s what Bidvest and the 2011 World Chef’s Tour Against Hunger participants are doing – working together. We won’t solve the problem of hunger on our own, but by bringing more and more like-minded people together we can make a start." "We are expecting the Bidvest World Chefs Tour Against Hunger to be the biggest fundraising event yet undertaken within the global chefs’ fraternity. We call on the public to get involved, enjoy all the nuggets of fun the Tour offers and dig deep to support our efforts to feed the children of South Africa. We know we can make a difference. You can too," concludes Gallagher.